Hello friends, I know, I havent posted the remaining two posts about Oman. But I am prompted to write this post since an excellent Book sale has returned and I wished to share the details with you here. 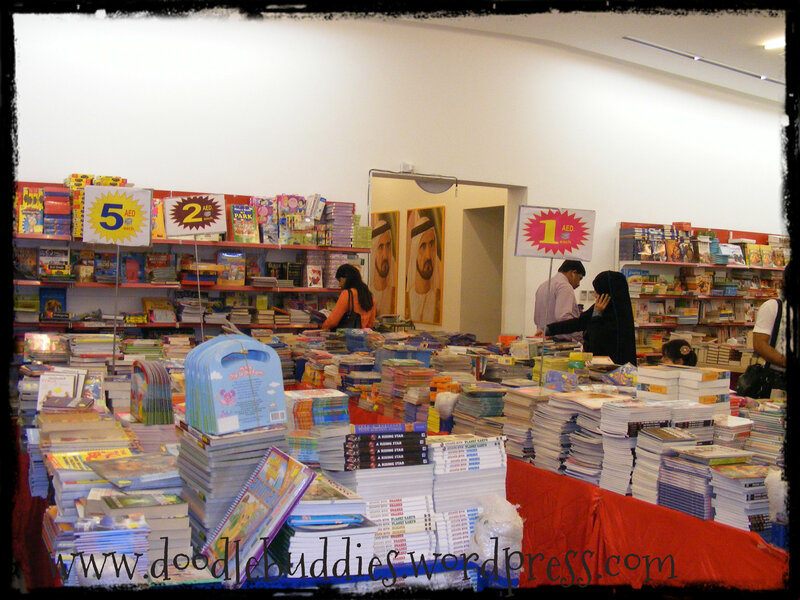 Here in Dubai, we are blessed with some good book stores like Magrudy’s, BookPlus and even a cozy, Bookworm. However, Books are still quite an expensive affair. I have always been an avid reader. I am not loyal to any particular author OR genre but i love to read. 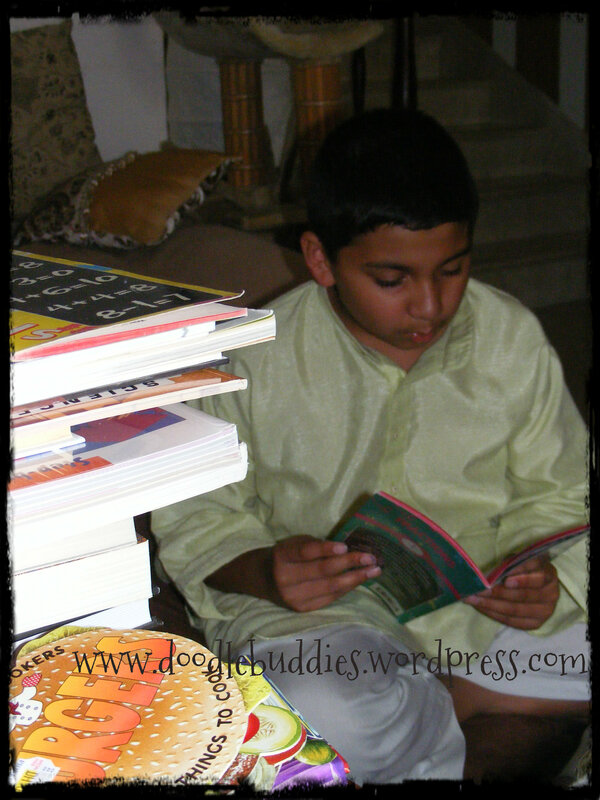 And from a tender age, I tried to inculcate this habit in my boys by reading to them. However, I have noticed, as they are growing up, they are drifting away from this gift. I dont know, if its this particular generation or if its the electronic medium’s influence but they are reading lesser than what I would want of them. Its a little disappointing but I still keep trying and probably ~ will keep trying ! I have friends who constantly complain that their children are glued to the play station or the video games and I know, I am not, in a much different boat than them. We have a library at home with nearly 300 books in them. But that alone does not warrant that they will continue to read. You can expect children to pick a book and start reading, but there is alot more to reading than JUST READING. Understanding the characters, the subject, the plot, the place, the entire idea and the moral of the story are equally important. I cannot stress enough the importance of reading becoz, you are already well aware of it and you will find it in several sites, however I am sharing with you a few pointers that I have introduced to my boys and that helps them understand, what is expected from them ( while and after) reading a book ~ gradually and steadily, I hope, it will be a part and parcel, of their reading practise. I dont let any of the boys sit in their study room (where their laptops are closer) or their bed room (way too many distractions) ~ I choose a time frame when they are not too tired ie. definetly not immediately after school. Read EVERYDAY !! Now dont think that has to be a book a day or a page a day or a chapter a day. It could be any book and it could mean, even a page of a story book, which could be continued the next day. For my youngest, I prefer shorter stories so that he could try and go half way the book. For my youngest, I still prefer books which have atleast a couple of pictures in the book so that he gets an image idea of the location and characters. It helps in building the imagination. When the boys were younger, and I used to read out to them, we used to play games as well based on the story. I’ve always been good with mimicry so I would change my voice to suit the character. I remember, they used to love it when I mimiced with sock puppets and lollipop sticks as puppets to enact a story ! I have them keep a small journal with them where they can jot down the date, name of the book and number of pages they read. Filling titles and pages, gives them a great sense of achievement while I can keep a track of who’s read what. In addition, I let them write down any new 10 words and two idioms or similies as well. This is a small exercise but I am begining to see the fruits of the hardwork. I find, their vocabulary improving gradually and I find, them using idioms and similies amongst themselves. And finally, on the last page of the journal, I let them write what they felt reading this book, why they think the ending was apt, and how they feel about the storyline. And if they would want to read it again. It really does not have to be a large passage ~ just a line or two. 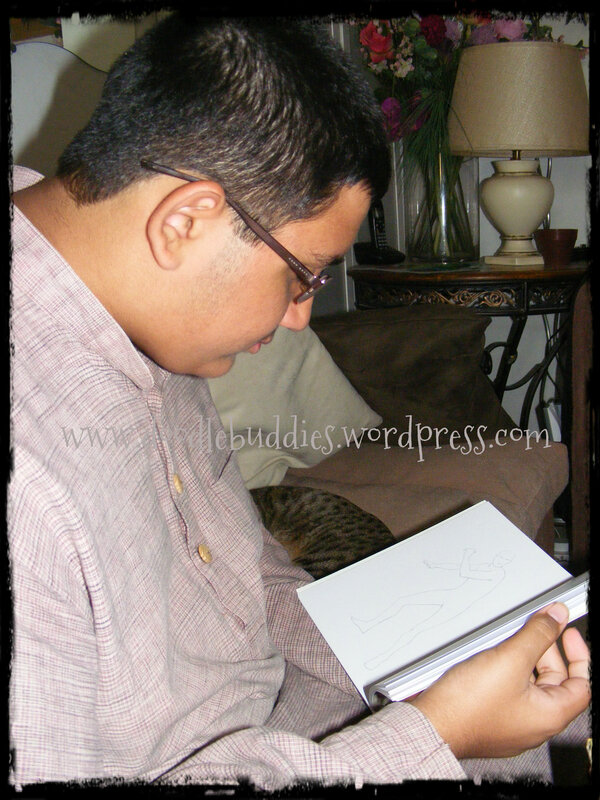 Buddy ~ excieted over his new art book ! Always read your content from a safe distance. Neither too close to your eyes neither too far away from your eyes. Always prefer quality over quantity. Better to read one great book than hundred mediocre ones. Understand properly what you have read and reflect upon it. Don’t accept anything blindly that you read but think for yourself and try to understand the reason behind what’s been written. Bookmark interesting pages for future reference. You never know when you will need them. Sometimes it takes more than one reading to fully grasp some thing. Don’t be disappointed if you don’t understand a book in one reading. Maybe when you come back to it the next time, you will get it. Focus completely on what you are reading. Don’t think about other stuff while reading. If possible, create a favorite spot in your house for reading books. You will feel more relaxed whenever you are there. And above all, enjoy your reading experience. The habit of reading good content daily will act like an exercise for your mind and keep you mentally fit and flexible. If you have never given it a try then always remember that it’s never too late to start a good habit. In Dubai, Feline Friends also run second hand book sales. 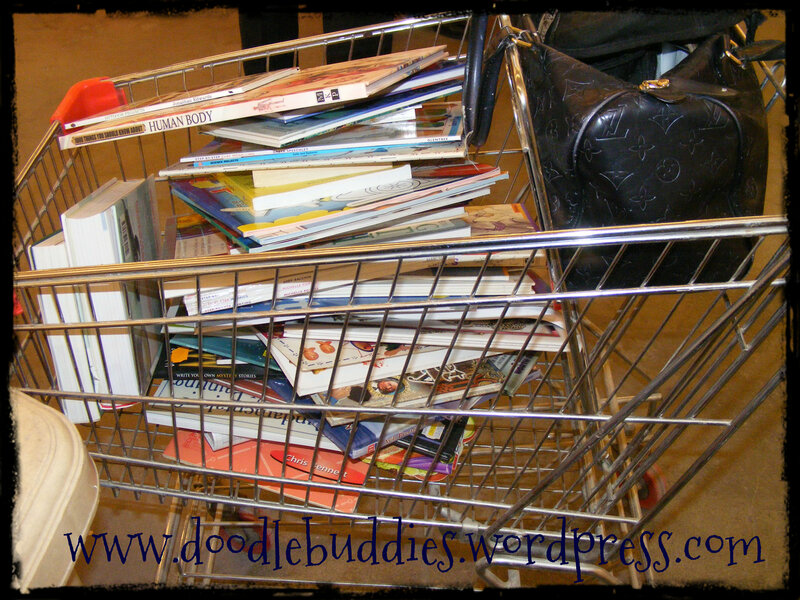 There are heaps of books in a good state and all for a good cause ! In addition to Times Center, they hold these sales at Mirdif city center, Arabian Ranches and Lakes community center. Ofcourse this not a routine. They put up posters and send emails to advise you, as and when the sales are held. Then again, for those who are looking for brand new books at unbelievable rates, I would recommend the Grand Book Sale by Pioneer Group. This once a year sale is generally held at the Airport Expo center, however, this huge crowd-puller has returned this year at a new venue ~ Traffic in Al Barsha (luckily for us) !! 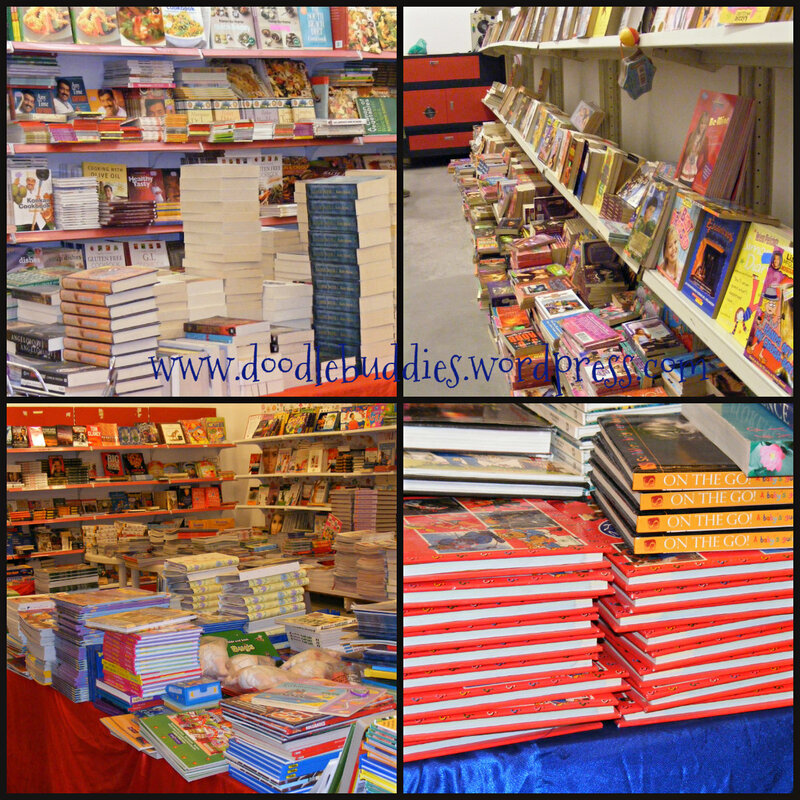 Booklovers are in for a real treat becoz this year particularly, it is a HUGE CLEARANCE SALE !!! which means the rates are phenomenally low ! 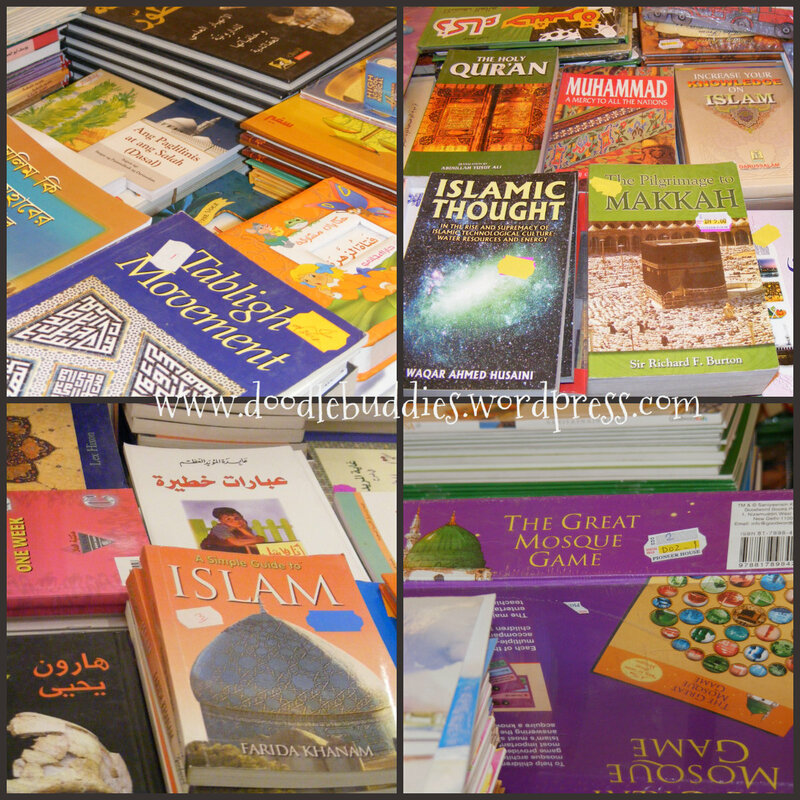 Amongst the 50,000 + books are educational, comics, hobby, short story books, novels, language books etc and a large section of Islamic books too. 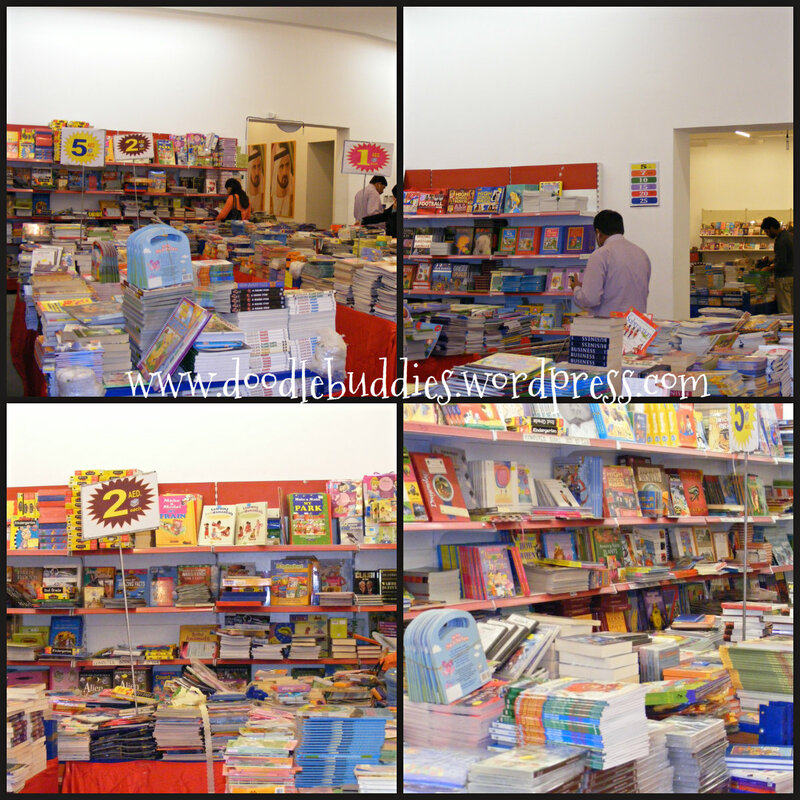 The sale is truly a festival for readers !! yes, did you notice Sanjeev Kapoor recipe books ? They are for dhs 15 each !! Unbelievable !!! The prices range in 1, 2, 3, 5, 10, 15,25 !!!!! 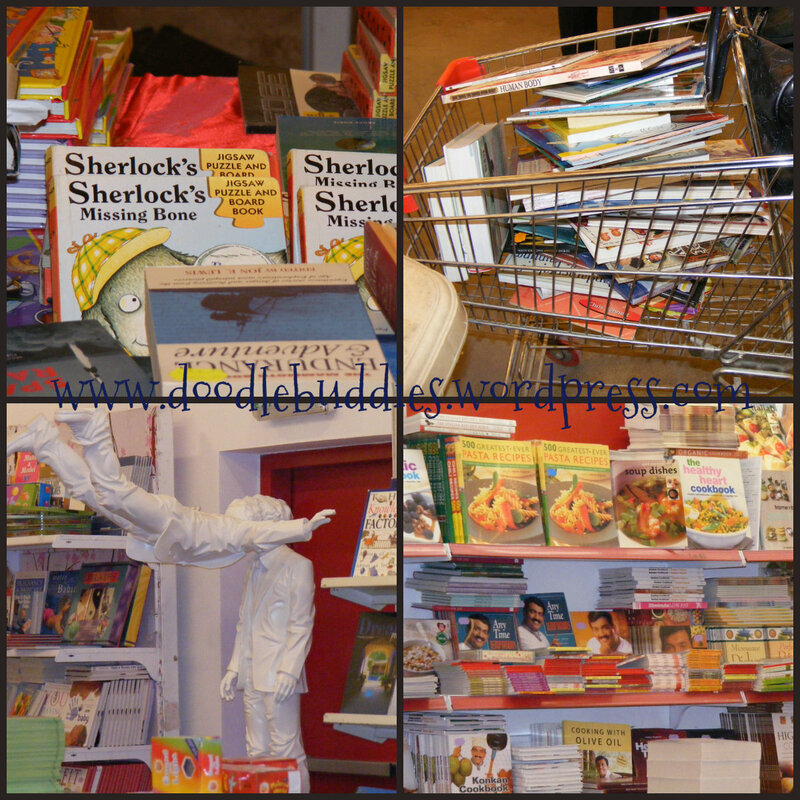 Naturally, I visited them on the first day and after browsing and drooling over the daunting task of taking ” just a trolley full of books”, Samie, joins me and yet another couple of hours later, another trolley full load of books are presented at the cashier counter !! 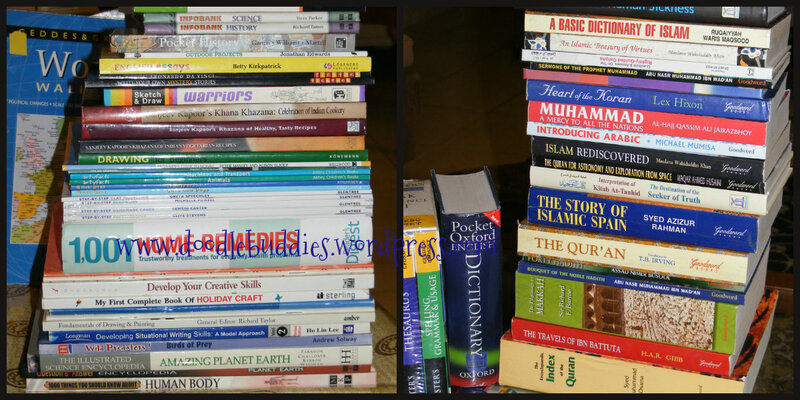 I assure you, its not a hoarding tendency ~ its just that you dont get such fantastic books at these insane rates !!! They are open from 9 am to 10 pm till 2nd December. I would highly recommend that you visit them in the morning hours when the crazy rush is limited. Oh and BTW, I haven’t been paid to write for the Pioneer Group and neither am I related to them !!!! I am just a fortunate book lover who wishes for all of you to take advantage of the amazing prices of these fantastic books !! If you have trouble finding the place, please feel free to contact me. I hope you benefit from this article and the information shared. 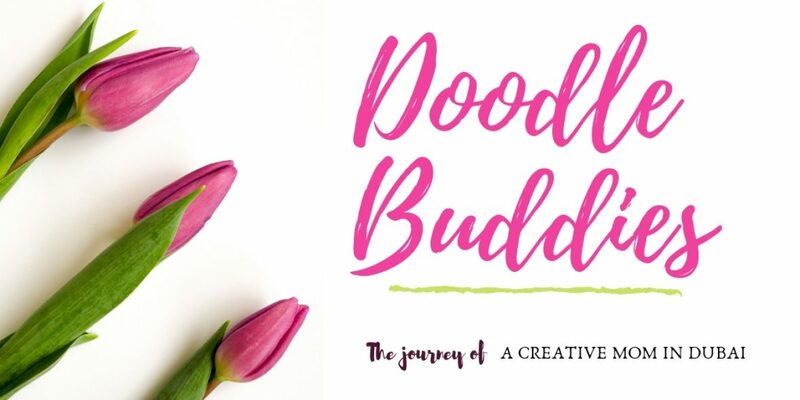 Often I have been asked on my blog if I run classes and could employ people and for some kind of guidance in this field. Recently amongst the many calls I receive for some guidance was from Rida F who also wished for some direction in this matter, staying in UAE. By no means, am I an expert but I could only provide some of my own experinence in this field. I am a papercrafter and create handmade greeting cards, altered art, book binding, and recylable items. In the past I have taught in schools and institutes but realized that these venues provide a large limitation on budget and generally dont fullfull their pledge when they advertize a product to their clients. 5 years back, I chose to not get involved in a full time business for various reasons which do not apply now. But becoz you could be in a similar situation I am disclosing it for you. 1: My kids were alot younger and I prefered to do something on the side, rather than jump into a commitment which I may not be able to fullfill. Next, having determined which direction you choose, “NETWORK” … It is a KEY WORD. 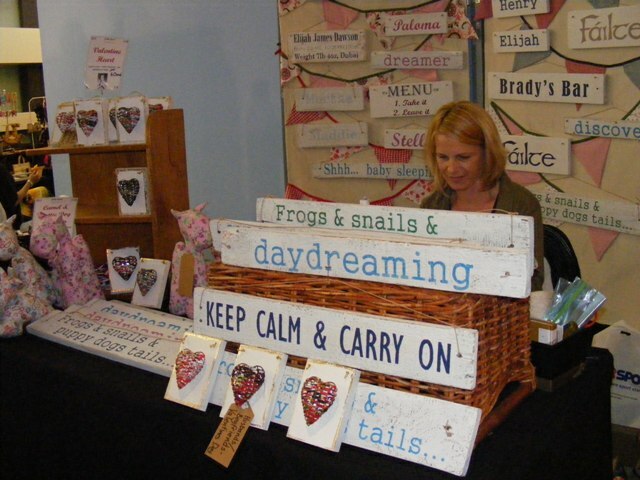 Talk to people at work or spouces friends, or neighbours, friends of friends and spread the word that you can offer some skills or you have products. Which ever, but first find out from your community, what response you get. Another important aspect is “LOCATION, LOCATION, LOCATION” as they say in the business jargan . Perhaps you reside rather far from where your potential customers are. Well, then you have to find a way or a channel to come to them, if they cant come to you. In my opinion, ARTE provides an excellent and very balanced channel for the new hobbyist. They are a monthly “souk” ~ exhibition/fair where you can participate on a monthly basis once you register with them. What I would adivse to some one like Rida, is that you should probably visit one of their exhibitions/fairs which is every first friday of the month at the Times Square on Sheikh Zayed road. Get a feel of how they exhibit and what are the kind of products that sell, talk to the vendors, and see how you think, you can place your self there. You can reach arte from here : ARTE or you can join their facebook group here : ARTE. One of the ladies at the fair with some fantastically creative wall hangings. If you feel more confident then this could be one way you could choose to move in. Another permantant option is where you take up a space/store/shop in a small sized mall or a larger mall. Depending on your budget, these are the basic two ways to go in. Both can turn out to be fruitful provided you believe you have what it takes to make it suceed. I know of ladies, who have started out from Arte, moved on to get a space thru the Freezone but they struggled, becoz they were located far from the reach of the ”REAL” client and I also know of women, who persisted with home business for years before actually opening up large size stores in more renowned malls. We all have our own situations to deal with so in the end, it boils down to what your situation and budget is like.